On Call Solutions has created a new program called After Hours Assurance™ to address a few of the challenges clinic owners face in their daily struggles to operate a profitable clinic, while providing value-added services for their clients. After Hours Assurance is a customized-for-your-clinic answering service and business solution that allows pet owners to pay to speak to a veterinarian from your clinic-after hours when they believe they have an emergency. refer that client to their recommended local emergency animal hospital. Research shows that 87% of pet owners who believed they had an emergency after clinic hours and called for consultation, did not actually require an emergency exam but could wait to be seen at their regular clinic during normal business hours. This allows the pet owner to save time and money and the veterinarian to provide quality, trusted advice while earning revenue for their time and expertise. available to answer calls after hours; however, they will only speak with clients who have already paid to use the service. In addition, thanks to our call center operator’s screening process of collecting or confirming payment, the on call doctor’s call volume will be reduced because it will not include many non-serious calls—if your clients have to pay to speak with a doctor, they may reconsider their reason for calling. Please note that our call center operators do not provide medical advice to your clients; they will confirm that the client has paid, obtain a brief summary of the pet owner’s medical concern and contact information to provide the on call doctor. 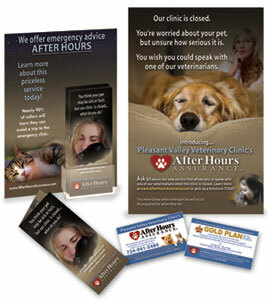 This also means that with After Hours Assurance, after you have spoken with your client, should you determine the patient requires immediate medical attention, you will have the flexibility to either: refer your preferred emergency animal hospital for pet emergencies that require a medical exam OR meet your client/patient in your hospital for emergency treatment. You and your veterinarians must determine an on call schedule and provide that to us. This may be a solo-practitioner who will take all after hours calls or a schedule of rotating doctors that will take calls. To speak with the veterinarian on call from your clinic after hours, your clients must first pay a fee for your After Hours Assurance service. You establish these fees based on what you believe your clients will pay and what your time is worth. We can help you determine these fees, if necessary. Based on your clinic's needs, you can determine what fee options are most appropriate. Our most common option is for clinics to offer a 'Gold Plan' and a 'Pay Per Call' plan. The Gold Plan is one fee for an annual registration, which allows those clients to call about their pet emergencies that occur after hours for an entire year, as many times as they believe they have an emergency. The Pay Per Call plan allows you to set your fees accordingly based on the time you take call before midnight, after midnight, and/or on major holidays. You may also decide to only offer one of these plans. For instance, a solo-practitioner might only offer a Pay Per Call option if they know they will not always be available every evening to take call. When offering only a Pay Per Call option, the clinic can decide to "turn off" their After Hours Assurance service as necessary and allow calls to go to a voicemail or answering machine with your specific directions for their after hour emergencies. Depending on the pricing plans you choose to provide, your clients will either pay for their chosen plan at the time of their emergency call, or pre-register to avoid the time involved with providing credit card information over the phone during a potential emergency (this would only apply to Gold Plan registrants). Clients who pre-register for your clinic's After Hours Assurance program can do so by speaking with an After Hours Assurance representative, mailing in the registration form located in the brochures placed in your clinic, going online to www.AfterHoursAssurance.com, or in your clinic. Pre-registering also allows your clients to pay with cash or check if they do not have a credit or debit card. We provide high quality, professional and customized marketing tools to introduce and direct your clients to register for your clinic’s After Hours Assurance service. You decide what level marketing package (quantity and type of marketing materials) you would like to have based on the size of your clinic and client database. Our complete marketing package includes: posters to hang in your exam rooms or lobby, brochures, wallet-sized reference cards for your clients to refer to in potential emergency cases, mailed letters on your letterhead, including a brochure, to your top clients introducing your new service, and a press release template. A one-time set up fee* covers the production of these customized marketing materials. In addition, our clients receive a FREE two hour phone consultation with LW Marketworks to discuss various marketing strategies from which your clinic might benefit. This consultation is designed to help you identify what marketing opportunities may be available for your clinic including those associated with After Hours Assurance, as well as anything else that you would like to promote or learn more about from a marketing stand-point. We also provide training for you and your staff, and After Hours Assurance Customer Service is available 24/7 for your clients. Your clients call your clinic when they encounter a potential emergency after hours. Their call is automatically transferred to one of our friendly, professional answering service operators, who are trained to qualify the caller by determining if they have already pre-registered, or if they will need to pay for access to your on call doctor. They will confirm the client's contact information, and summarize the emergency concern as quickly as possible so they can page the on call veterinarian from your clinic. Callers who have not yet registered, or who decide they do not want to pay to speak to an on call doctor from your clinic, will be referred to your local emergency animal hospital at that time. If they prefer to speak to your on call veterinarian about their pet emergency, our representative will process their credit or debit card payment over the phone. Then the call agent will request a brief summary of the pet owner’s medical concern and the phone number on which the doctor can call them back. After speaking with our operator, the on call veterinarian will call the pet owner and advise them as to whether their pet requires immediate medical attention, or if their pet can be treated at home and/or wait to be seen in your clinic the next business day. If immediate medical attention is required, the doctor will either refer the pet owner to their preferred emergency animal hospital, or meet them in their hospital for treatment. Your clients appreciate that they’ve received trusted advice from their trusted primary care veterinary clinic, and in many cases your on call doctor also saves them time, the stress, and the expense of an unnecessary trip to the emergency hospital. If you can recommend that your client comes to see you in your clinic during your regular hours, you earn revenue that would have gone to the emergency hospital had they made the trip without first speaking with your on call veterinarian. However, should you advise your client to go to the 24-hour emergency hospital after listening to their emergency concerns, you still provide a valuable service to your client in their time of need. In these cases, your client has the peace of mind of knowing their pet does require immediate medical attention. Plus, you are able to schedule any necessary follow up visits in your clinic for the next day. In addition, because so many pet owners are now traveling with their pets, our call agents will locate an emergency animal hospital in their area and provide that information to your on call doctor. Should emergency treatment be recommended by the doctor, they will have information to supply to the pet owner on a nearby clinic that can handle their emergency. Should the doctor decide to do so, they can call that animal hospital to inform them that the pet owner is on their way and advise on the situation. This benefit has proven to be extremely valuable to worried pet owners in unfamiliar cities! You will have online access to track your revenues earned from pre-registration sales, call fees, and clinic-visit revenues generated. You can also expect to grow your client base by offering and promoting this valuable service in your clinic—as a differentiator over your competition. At the end of each month, you'll receive payment for the revenues you've earned! Your client receives peace of mind. You receive compensation.